Steve Divnick has patents in a variety of product lines. This is a short description of the development of the Divnick Adjustable Loft Telescopic Golf Club. Divnick started playing golf in 1988. After teeing off on the first hole, he reached down, picked up his heavy bag of second-hand clubs and started walking toward his ball. Along the way, he turned to his cousin and said, "This is crazy...lugging this bag of clubs around like we're a couple of porters hauling gear for a safari! I'm going to build a club that does all the shots!" That afternoon, he started working on what would become the patented golf club 3 years later. He didn't know when he started that there had been more than 120 patents on adjustable and telescopic golf clubs since 1895. Divnick consulted with some local pros who told him they had seen and tried adjustable clubs in the past, but they didn't work very well...that they gave up too much performance compared to regular sets. That was actually great news for Divnick because it confirmed that the market was wide open to an adjustable club that would perform well. He read everything he could find about club design, weighting, flex, materials, casting and much more. Through that process, he learned about previous designs and studied all the existing adjustable loft patents. It became clear that they all lacked the playability, performance, and feel of modern clubs with perimeter weighting and forward-of-the-face hosel alignment. Divnick wanted to create a club that performed just like a modern club, and that had an easy-to-adjust mechanism, a built-in tightening lever, a low center of gravity, and a telescopic shaft that felt as solid and performed as well as the best name-brand clubs. He started experimenting with drawings, models, and prototypes. After 4 years of modifications and testing, he had a high-performing durable club that carries a lifetime guarantee. The patent was relatively easy to acquire because it had 18 elements that were different than all 120 prior adjustable club patents. 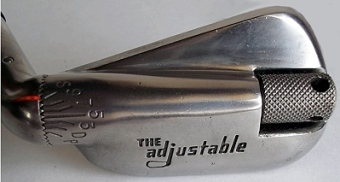 One of the more modern adjustables was the Miracle Club from the 1950's, which later evolved into a club called, "The Adjustable"...both pictured here . They are typical of many of the adjustables which placed the mechanisms in the middle of the back of the head, just like the oldest patented adjustable clubs. This resulted in a very high center of gravity, and the shaft alignment behind the head, rather than in front of the face as with modern offset shaft alignment. The result was inconsistent and unrewarding shots. Notice that the only substantive difference in the two clubs pictured here is a little more sole-weight on The Adjustable. Other than that, the index marks are on the hosel of the Miracle, and on the head of The Adjustable. Minor differences like that were common with many of the earlier patents. 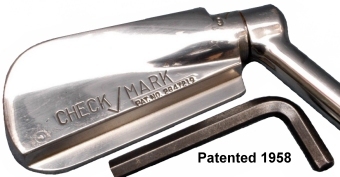 The Divnick was a huge leap forward in design and function. Click here to see more comparisons of the Divnick club with other versions which preceded it including what Divnick believes is the best of the competition, along with side-by-side photo comparisons of the most important design and function elements, and a robot lab performance analysis. 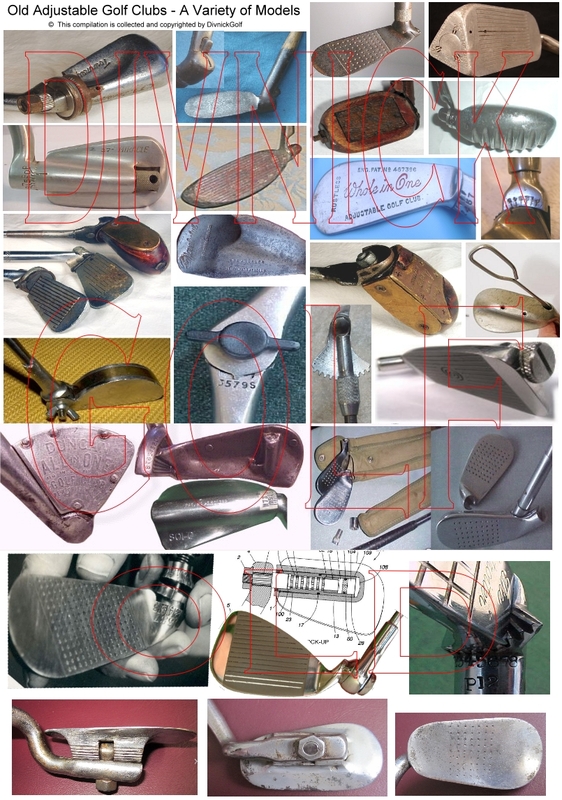 This collage of adjustable clubs shows some of the progression of designs over the last century. 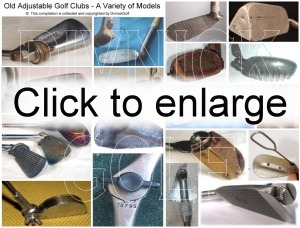 With the age of the Internet and sites like Ebay, it is common to see old adjustable loft clubs for sale. They are always listed as "rare" or "vintage" in the hopes that they will fetch a higher price. But they typically sell for less than $100, so they don't really qualify as collector's items. Rather, this common availability underscores the fact that adjustable loft golf clubs are not an unusual thought. In fact, Divnick receives comments from many customers who say, "I thought of the idea of making an adjustable club for my own use, then I found your website and you are already doing it!" What makes the Divnick design stand out and succeed where others failed is its function and performance. It performs like a conventional modern club with the convenience of a rock-solid telescopic shaft. That is a winning combination!